OK, an unusual blog post today. This is in the midsts of way too many work things going on at the moment, all of which are good and all of which deserve all of my time. However, in the name of art and all things conceptual, if ethereal I wanted to complete this now. A little background is needed. My mother is currently enrolled on an art foundation course at Oxford and Cherwell valley College in Banbury where she goes to broaden her art experience three days a week, in between full-time roles in many guises. At Banbury they have a variety of media they are taught to use, from pencil, paint and charcoal,textiles,photography and 3D to various clever computer programs. Some of the projects last just a short time and some can last a few weeks, from the planning and researching through to the execution. Though clearly this is not always the case, it has always seemed to me that in conceptual art the idea itself and not the construction is often the powerful element, so I made a suggestion that the term dispersal could be taken in an alternative way. Though indeed the candles are dispersing, by passing on the information about this concept to others, the information itself is being dispersed. I suggested that this project could become an international dispersal if the idea was written about and the final record of it was posted on the blog. 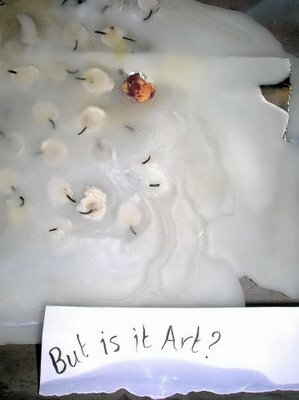 Unwittingly you have now become part of a conceptual art project, your brains being the medium! So, the actual setup also benefits from a little explanation. 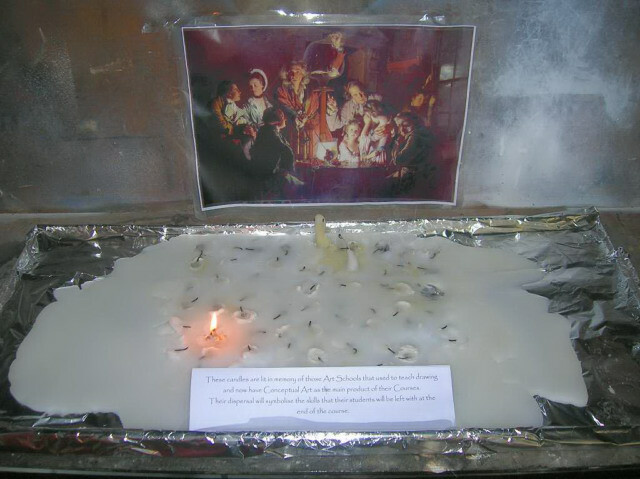 Behind the candles is a picture called "Experiment with an Air Pump" by Joseph Wright which symbolises both the art of fine drawing and the art of the experiment. 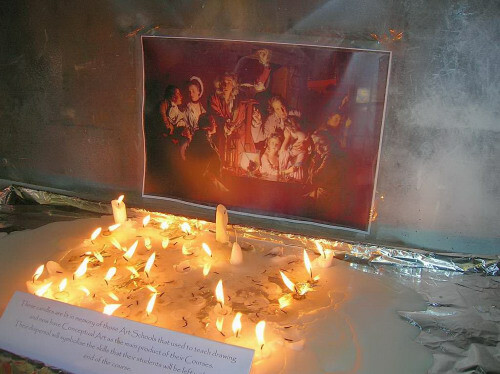 This picture ties in with the project again in the use of candles, though in another form and the skull mirrors the dispersal of information from one person's brain to another. The young girl covering her eyes symbolises the lost skills burning down before her. 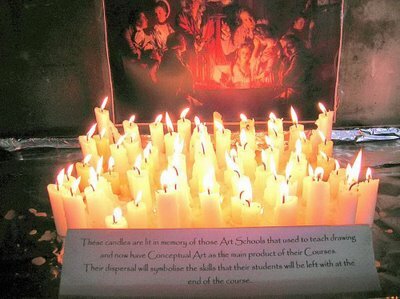 The text in front says: "These candles are lit in memory of all those Art Schools that used to teach drawing and now have conceptual art as the main product of their courses. Their dispersal will symbolise the skills that their students will be left with at the end of the course." So, without further ado I give you the photographs chronicling the dispersal of skills, as the idea itself is dispersed who knows where. Thanks Ben, I hope all is well up North. TF, I look forward to hearing of your adventures.